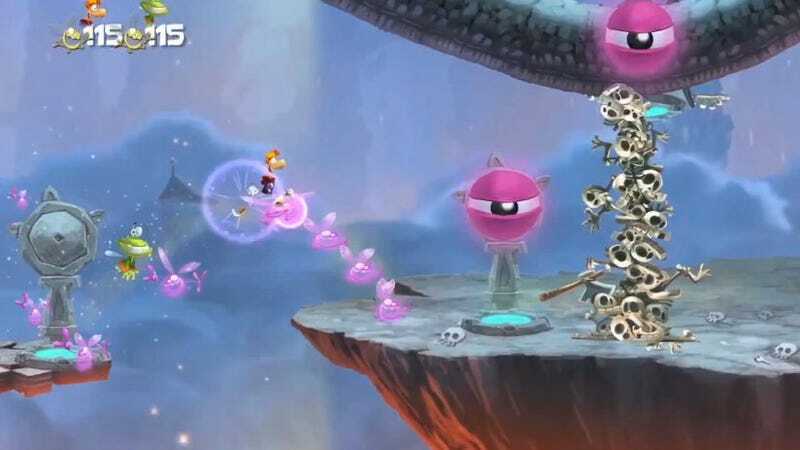 Rayman Legends Was Supposed to Be Out Today on Wii U. But, Hey, Here's a Silver Lining. Those of us who got Wii U systems last November were supposed to reach an oasis today in our crawl through the machine's oh-so-typical year-one software desert. We were supposed to be playing the sidescroller Rayman: Legends right now. We're not. The game was recently, painfully delayed to the fall. If it reduces the sting at all, folks, Ubisoft CEO Yves Guillemot at least told me that the game is still being worked on. He says it's not, as some feared, sitting somewhere entirely finished and just waiting for Xbox 360 and PlayStation 3 versions to be made. "The Wii U the team is working hard on the Wii U [version] to make sure it continues to improve, so it can become one of the best Wii U games," he told me at last Wednesday's PlayStation 4 kick-off event, after we chatted about Sony's new console. "We hope it can be one of the top games Ubisoft creates." The game's recent delay infuriated Wii U fans who wanted what they hoped would be a very good game during an otherwise very slow time for the new console. Many fans assumed the game was done and Ubisoft hasn't tried very hard to counter that impression. The idea that a possibly-finished game might be held back made things worse, sparking online protests and even an in-person one at the game's Ubisoft studio in France. The publisher eventually extended an olive branch, offering a free online version of the game—its "challenge" mode—for Wii U owners for release this April. "I think the free version will just be amazing," Guillemot told me, saying it will have "very social gameplay that I think people will love." It's still not clear what triggered the delay, and Guillemot didn't clearly state to me that the game couldn't have come out for Wii U right now. Rather, he made it sound like, regardless of the reason for delay, that the game would improve. "What's very important to consider is that," he said, "when a team has more time, they are able to continue to improve the quality of the game. When we saw we had more time, we saw all of the possibilities. Some of the possibilities are the social features that we are seeing today, but also new bosses, new possibilities that will take the game to a level that people will love." Why he referenced social features shown "today"—the day of the Sony press conference—for the PS4, when we were ostensibly discussing a Wii U game, is unclear to me. The sense I got was that he was referring to the basic idea of making games more connected, something Ubisoft did superbly with their Wii U launch game ZombiU—not that he was alluding to a possible PS4 version of Legends. I think some Wii U fans might prefer to have even a half-decent version of Legends now instead of nothing. Year one of owning a new console... it ain't a picnic.